Compare this to the gold elite. Surprisingly its called a "zealot". There was an ancient race of Xelagna (forerunner?) who tried to create the ultimate race. They first created the protoss who had psi powers and such. The Xelagna finnaly showed themselves to the protoss and the protoss had a civil war. The Xelagna left their failed creations to their selves. The Xelagna Then decided to start on a new creation. They created the Zerg (Flood?) on a barren desert world (hmm, did blizzard read the vang?). The Zerg were parasitic worms who gathered DNA of other species and created other mutations. 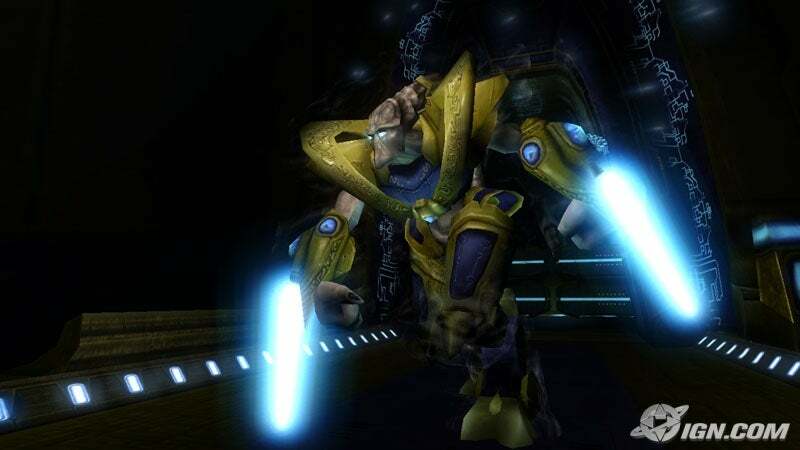 The Zerg soon made command untis which were kinda like the Keyes blob. They communicated with psi powers. The Zerg soon took over their planet as the dominate species. The Zerg soon figured out how to launch into space (I forget how) and destoryed their creators. Soon after the Zerg destoryed the Xelagna they found a whale like space fairing creatures (they were quite large) and took their DNA and created living starships. Also in "The Vang" the battle master could create whatever living being it needed for the task at hand. (Much like the Zerg.) I hope that doesn't apply in Halo 2. Whew. As Chris Butcher says, "the forgotten peril that ended a galaxy-spanning empire is a pretty fundamental tenet of good sci-fi (yeah, yeah, and bad sci-fi too)." Even so, quite the parallels. "...there's huge amounts of care that goes into putting [the levels] together. Contextually, we were playing in a piece of New Mumbasa [sic]. This was one of 49 power stations that was actually brought online in the 23rd century and was then decommissioned. We want to make sure that there's a history there, that there's a sense of place there." While it comes as no surprise that Bungie would try to add as much history and depth as possible, it is worth noting that this level of historical detail and contextual flourish is significantly greater than that given to the first game's multiplayer arenas. While watching Demolition Man a few days ago, I noticed a few similarities between it and Halo. 1. Sylvester Stallone's character in the movie is "John Spartan"
2. He was frozen cryogenically. "John Spartan, you are fined one credit for a violation of the verbal morality statute"
Some character connections between John, his Mjolnir armour, and... you know, Thor, Norse mythology... that kind of thing. "MJOLNIR Definition: The legendary weapon of the Norse God Thor. "Mjolnir" means "lightning crusher." Made by the Dwarves Brok and Eitri, it possessed magical qualities. It would magically return when thrown, and was used for healing and even resurrection. The hammer was feared by the enemies of the Aesir, and stolen by the frost Giant Thrym, who demanded the goddess Freyja in exchange for its return. Instead, Thor disguised himself as the goddess, siezed control of the hammer, and slew all of the giants in the hall." And this came from a site on Norse gods here. Along with these accouterments and imagery, Thor was the quintessential thunder god in that he was a fervid enemy of the Frost Giants (Elites and hunters perhaps?) -especially of the monstrous world serpent, Jormungandr. Thor repeatedly sought out this monstrous beast. Twice it got away, but Thor finally killed it at Ragnarok, though dying in its venom. Despite the fearsome reputation Thor had with the Giants, he occasionally enjoyed their company. His is usually accompanied on these wanderings by Loki, who was originally a Giant though adopted into the Aesir. This is part of the reason modern mythographers suspect Loki personified fire, as lightning strikes could ignite fires. In some stories Thor could be characterized as a brutish buffoon (Cortana: Its not a cudgel you Barbarian!). This is exemplified even at the sad occasion of Balder's funeral, where he booted a dwarf (appropriately name "Lit") onto the pyre. I noticed that someone compared 117's title as Reclaimer to King Arthur. I read up on Legends of Charlemagne and came across an interesting character by the name of Ogier the Dane. Ogier was seven feet tall and was given the sword Cortana upon rescuing Charlemagne in battle. (Seven feet tall with Cortana in tow? hmmm....) Long story short, Ogier is kidnapped by a jealous Fairy by the name of Morgana and is kept on an island with King Arthur where they await their opportunity to reclaim the King's throne. I'm a sucker for Marathon connections, so I thought I would add this terminal passage too. The Widow? The Queen? The Operator/Melissa? Evacuation of Troy? James James? SPARTAN 1.0's? Dana (Gheritt?) White? ARG's? Axon hot? ilovebees.com? UPDATE: Webshift's chronologically-ordered sound clips. Sharp observers might have spotted a very interesting discussion over on the HBO forum earlier. The first post in the thread is quite long, but the insight and care put into it (not to mention - *gasp* - spelling and grammar! ;)) more than make up for it. It brings up the controversial topic of multiple timelines/time travel, but has a pretty solid basis in official Halo story sources. Go check it out!